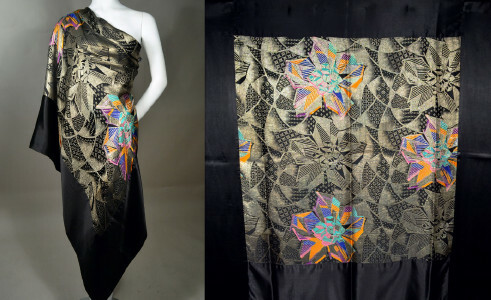 Spectacular twenties vintage ART DECO lame shawl. Silver and black silk lame with brilliant splashes of orange, purple, turquoise and blue. Art deco visual arts were born in Paris in 1925, called the Exposition Internationale des Arts Decoratifs et Industriels Modernes. This stunning MODERNE print was obviously influenced by the artists that came out of this period and has a definite architectural feel to the angular pattern. Black silk satin border on all sides. The ultimate in 1920'S opulence. AMAZING! Shows only slight burnish at silver threads near center. A minor flaw! No damage to report.